(continued…) We do not know much about Cain, but you do know quite a bit about yourself, and so now apply this lesson to your own life. Do you think you would be qualified to make such a comparison between you and any other person on earth, no matter how well you know them, and decide who was more favored by God and more blessed? You might see somebody with more money, but you may know nothing of their battle with depression. You might see somebody with all kinds of friends, but you may know nothing of their family troubles. You might see somebody that is younger than you are and already retired, but you may know nothing of the health problems they are facing. You might see someone that really does have it all, but having it all is sometimes the very worst thing that can happen to a person. Jealousy is such an foolish position to take on anything because one never has enough information to make a valid comparison. Never. You might be glad to trade places with someone’s savings account, but you would not want to have to take their bad heart along in on the deal. You might want to have the athletic ability of your friend at school, but you would not want their home life with their abusive parents. You might envy someone down the street who has a house in Florida and a cabin on Lake Superior, but you might not know that they have a grandchild dying of cancer. If you could bag up all of your troubles and all of your blessings, and could trade the whole bag with anyone else’s bag of everything, you may very well look far and wide before giving up and being content with your own bag woes and joys. In the story of Cain and Abel we have to pay close attention to what the Bible doesn’t say, because if we look only at what it does say, we might be tempted to accuse God of favoritism. But we don’t have nearly enough information about Cain and Abel, just as we don’t have enough information to judge even our own lives, or make a valid comparison with anyone else’s. Cain did not have the wisdom to do that. Cain quickly jumped to some ignorant conclusions about God’s fairness and became jealous. God warned Cain to not let his anger get the best of him, even promising future favor and acceptance. But Cain was too angry to hear God, and in a jealous rage went out and killed his brother. Usually jealousy does not lead to murder; but it never does us any good, and it can lead to the loss of joy and even faith. Jealousy can be defined as looking at someone else’s blessings instead of your own, and if you do that too much, you will begin to forget the many ways that God has blessed you, and then, perhaps, even forget all about God. There is one more thing that the Bible doesn’t say in this story that we need to consider. God speaks to Cain with a warning and with a promise. But God never does explain anything to Cain. God says nothing about why his offering was not accepted. And God isn’t going to tell you either why you have the troubles that you have, and why someone else seems to always have it better. We never get such explanations. But isn’t it interesting that we wonder about these things only in the negative? We often ask during our troubles, ‘why is this happening to me?,’ but we seldom ask that question when all is well. For example, you may well ask why someone else is able to afford more nice things than you, but you are far less likely to ask why you are in better health than most people your age. And either way, we are never given the answer. There is much in life that we are not told, but in this as in all areas, we are told enough, and we are then expected to trust in God for the rest. That is what it means to have faith. We can ask the unanswerable questions like ‘why do I have all these health troubles, family troubles, and financial troubles?,’ and ‘why can’t I have enough money and the good health to do what I want to do?’ Or, instead asking the unanswerable questions, we can go with what the Bible has told us and what we do know– God has given us this life with whatever blessings we have, and he has promised us an eternal life without any of the afflictions that we have here, and he has done this all freely and without any earning or deserving on our part. There is so much more to be grateful for than to be jealous over. Sometimes, in order to understand what a story means, we have to pay attention to what the Bible doesn’t say. But even then, it is still most important to hear what the Bible does say, and the Bible says to give thanks unto the Lord, for the Lord is good, and his mercy endures forever (Psalm 106:1). Psalm 25:4, 5 — Show me your ways, Lord, teach me your paths. Guide me in your truth and teach me, for you are God my Savior, and my hope is in you all day long. Almighty God, give us a measure of true religion and thereby set us free from vain and disappointing hopes, from lawless and excessive appetites, from frothy and empty joys, from anxious, self-devouring cares, from an eating envy and swelling pride; so that we may possess that peace which passeth all understanding, through Jesus Christ our Lord. Amen. First of all look at what the story says. Both boys were farmers. Abel went into livestock and Cain was a cash cropper. Both young men brought what they had for a sacrifice to the Lord. Cain probably brought some of his best corn and soy beans. Abel brings the best portions of the firstborn of his flock. So far, so good. But then things go wrong. The Lord looks with favor upon Abel’s offering, but does not receive Cain’s offering with favor. We are not told how this favor or lack of favor is shown, but the Bible does make it clear that one was favored and one was not. Cain got angry about this, so angry that the Lord had a talk with him and warned him against doing something wrong. 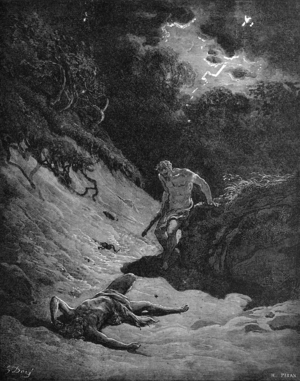 Cain ignored the warning and went out and killed his brother. And so, the first child born in this newly created world became the murderer of his own brother. The Lord then questioned Cain on the whereabouts of his brother, and Cain said he did not know anything. But the Lord, who knows everything, punished Cain, making him a restless wanderer on the earth for the remainder of his days. There is something very disturbing about this text. Certainly Cain responded wickedly to the situation, but why did God create the situation? Why in the first place did God not accept Cain’s sacrifice? Both boys were performing their religious duties. Both boys brought the best of what they had. And there was no word of Cain doing anything wrong before this. Why then did God respond the way he did, favoring one and not the other? Doesn’t God share at least a bit of the blame by creating the opportunity for this jealousy? What the Bible says gives us no help in answering this question, so it is here that we have to begin to look at what the Bible doesn’t say. And first of all, the Bible doesn’t say anything about any other sacrifices. People in the Old Testament were often making such sacrifices, and so why should Cain get all upset about how just one of those sacrifices is received? As I said, we know very little about this particular sacrifice and what was required by God, and how God showed his favor or disfavor– but we do know that it concerned only this one sacrifice. And figuring out what God is or is not doing in this world is a hard enough business without trying to figure it out on the basis of just one event. The Spirit moves when and where it pleases, said Jesus in the Gospel of John, and you cannot force or insist on God’s favor and blessings on your terms. In fact, God even guaranteed Cain such future blessings, saying, “If you do what is right, will you not be accepted?” The story tells us about only one sacrifice, and that is not nearly enough to go on, not for us and not for Cain himself, either. But I did have a prayer with and for Jeanette. I do not know if at that time she could hear or understand anything anymore, but even if not, the prayer was for her because I believe that even in that situation, we do have a prayer. And the prayer I had for Jeanette was right out of the pages of the Bible, from Luke chapter two. It was the prayer of an old man, Simeon who, like Jeanette, was near the end of his life. And old Simeon, with the baby Jesus in his arms, prayed, “Lord, now let your servant depart in peace, according to your promise; for my eyes have seen your salvation, which you have prepared for all people.” That old man, his life nearly over, with nothing to look forward to but the grave, still had a prayer, a prayer that has been repeated millions of times over the years by others who, from all outward appearances, didn’t have a prayer. “Let me depart in peace, Lord,” he prayed, “for I have seen your salvation.” By that Simeon meant that in the baby in his arms was the fulfillment of all God’s promises, and Simon was blessed to be able to see him. And so Simeon prayed, “You can take me now Lord. I have seen Jesus and I am ready to die.” And so by Jeanette’s deathbed, I prayed that Scripture, “Lord, now let your servant depart in peace, according to your promise.” It might have looked like Jeanette didn’t have a prayer, but with faith in our Lord Jesus, we always have a prayer. Christians actually have quite a few prayers for those times when it looks like we ‘don’t have a prayer.’ There are, for example, those familiar words of the 23rd Psalm; “Even though I walk through the valley of the shadow of death, I will fear no evil– for you are with me, Lord, and you comfort me.” And think back to one of the first prayers you ever learned: “Now I lay me down to sleep, I pray the Lord my soul to keep, and if I die before I wake, I pray the Lord my soul to take.” ‘If I die?’– isn’t that a much too scary thought to plant in a little child’s mind just before going to sleep? Some children’s prayer books have now changed the wording, leaving out that part about the possibility of dying overnight, and that may seem to make some sense. But thinking back to my childhood, I do not remember anything scary about that prayer. I do recall, even as a child, thinking about death as I said those words. But I don’t remember being disturbed by that thought coming in the context of that prayer. Rather, I remember it as something that gave me a bit of comfort. Kids know that even kids can die, but even ‘if I die before I wake,’ I will be all right. Someone will be there to receive me, and to take care of me, even then. As Jesus said to his disciples in John 14, “I will come back, and I will take you to myself, so that where I am you may be also.” And if I die before I wake, I pray the Lord my soul to take. Awake or asleep, living or dying, we always have a prayer. If ever it could be said that someone didn’t have a prayer, it could be said about a man hanging on a cross. In all my reading about crucifixions in the ancient world, I never once heard of anyone being taken down off a cross and allowed to live and go free. After being scourged and then beaten and then nailed to the cross, it appeared to all onlookers that Jesus was finished and without a prayer. But Jesus did, right at the end, still have a prayer. He said, “Father, into thy hands I commend my spirit.” What a prayer! What a perfect prayer for when it looks like you no longer have a prayer. May we have the faith to live like Jesus lived, and then die like Jesus died, with a prayer like that on our lips. If you believe in Jesus, you are never without a prayer. This life will often seem to leave you helpless and hopeless. But in Jesus we have someone who will be our helper in time of need and give us hope in life and in death. Luke 2:29-32 — Lord, now lettest thou thy servant depart in peace, according to thy word: For mine eyes have seen thy salvation, which thou hast prepared before the face of all people; a light to lighten the Gentiles, and the glory of thy people Israel. Luke 23:46 — And when Jesus had cried with a loud voice, he said, “Father, into thy hands I commend my spirit,” and having said thus, he gave up the ghost. 189) Was Jesus Only a Great Teacher? …Among the Jews there suddenly turns up a man who goes about talking as if He was God. He claims to forgive sins. He says He has always existed. He says He is coming to judge the world at the end of time. Now let us get this clear. Among Pantheists, like the Indians, anyone might say that he was a part of God, or one with God: there would be nothing very odd about it. But this man, since He was a Jew, could not mean that kind of God. God, in their language, meant the Being outside the world who had made it and was infinitely different from anything else. And when you have grasped that, you will see that what this man said was, quite simply, the most shocking thing that has ever been uttered by human lips. One part of the claim tends to slip past us unnoticed because we have heard it so often that we no longer see what it amounts to. I mean the claim to forgive sins: any sins. Now unless the speaker is God, this is really so preposterous as to be comic. We can all understand how a man forgives offenses against himself. You tread on my toe and I forgive you, you steal my money and I forgive you. But what should we make of a man, himself unrobbed and untrodden on, who announced that he forgave you for treading on other men’s toes and stealing other men’s money? Asinine fatuity is the kindest description we should give of his conduct. Yet this is what Jesus did. He told people that their sins were forgiven, and never waited to consult all the other people whom their sins had undoubtedly injured. He unhesitatingly behaved as if He was the party chiefly concerned; the person chiefly offended in all offenses. This makes sense only if He really was the God whose laws are broken and whose love is wounded in every sin. In the mouth of any speaker who is not God, these words would imply what I can only regard as a silliness and conceit unrivalled by any other character in history. I am trying here to prevent anyone saying the really foolish thing that people often say about Him: ‘I’m ready to accept Jesus as a great moral teacher, but I don’t accept His claim to be God.’ That is the one thing we must not say. A man who was merely a man and said the sort of things Jesus said would not be a great moral teacher. He would either be a lunatic– on a level with the man who says he is a poached egg– or else he would be the Devil of Hell. You must make your choice. Either this man was, and is, the Son of God or else a madman or something worse. You can shut Him up for a fool, you can spit at Him and kill Him as a demon; or you can fall at His feet and call Him Lord and God. But let us not come with any patronizing nonsense about His being a great human teacher. He has not left that open to us. He did not intend to… Now it seems to me obvious that He was neither a lunatic nor a fiend: and consequently, however strange or terrifying or unlikely it may seem, I have to accept the view that He was and is God. II Corinthians 5:19 — …God was in Christ reconciling the world to Himself, not counting their trespasses against them, and He has committed to us the word of reconciliation. Almighty God, you have given your only Son to be for us a sacrifice for sin, and also an example of the godly life: Give to us grace to receive thankfully the fruits of his redeeming work, and to follow daily in the blessed steps of his most holy life; through Jesus Christ our Lord. Amen. 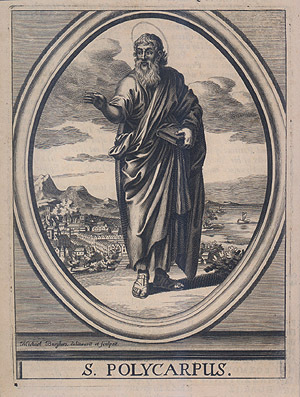 Polycarp (69 – 155), was an early church leader known as a kindly pastor and a defender of orthodox doctrine. He later served as Bishop of Smyrna. During a festival in Smyrna in 155 AD, Christians who refused to worship the emperor were threatened with execution. Officials particularly wanted to arrest the revered Polycarp, hoping he would deny the faith and disgrace the Christian community. Polycarp’s friends provided a hiding place, but a boy reported his whereabouts to authorities. Soon the hunt was on, and the old man was discovered, shackled, and brought before authorities. We write to you, brothers, concerning that which took place to those of us who gave witness unto death, in particular the blessed Polycarp. Cut by scourges until the anatomy of the body was visible, even to the veins and arteries, they endured everything. They proved to all of us that in the hour of their torture the Lord himself stood by them. In the same way they endured fearful torment when they were condemned to the wild beasts and were subjected to all kinds of other tortures. The tyrant hoped to induce them to deny their faith by the prolonged torture, but thanks be to God he was powerless against them all. The noble Germanicus strengthened the weakness of others by his steadfastness. He wrestled gallantly with the wild beasts. When the proconsul tried to persuade him, saying that he had pity on his youth, he forcibly pulled the wild beast towards himself, wishing to be freed more quickly from this godless and unjust life. Only one man, Quintus, turned coward when he saw the wild beasts; after earnest entreaty the proconsul persuaded him to take the oath and to sacrifice to the gods. But Polycarp, in contrast, when he first heard of all this, acted admirably by showing no fear. When they at first did not find Polycarp, they arrested two young slaves, one of whom became a traitor under torture. Taking the young slave with them, the constables set out against Polycarp with a squadron of mounted men. Late in the evening they found him in an upper room of a small cottage. They were amazed at his great age and his calm dignity. He immediately ordered food and drink to be served them, as much as they wanted, and he asked them to give him an hour for undisturbed prayer. When the moment of departure came, they seated him on a donkey and brought him into the city. When he entered the arena there was such a tremendous uproar that nobody could be understood. No sooner was this announced by the herald, than the whole multitude yelled with uncontrolled anger at the top of their voices, “He is the father of the Christians! The destroyer of our gods! He has persuaded many not to sacrifice and not to worship.” This they shouted, and they demanded that a lion be let loose upon Polycarp. He explained that he was not allowed to do this. Then there arose a shout that Polycarp should be burned alive. Now everything happened much faster than it can be told. The mob rushed to collect logs and brushwood. When the woodpile was ready, Polycarp took off all his outer clothes and opened his belt. The fuel for the pyre was very quickly piled around him. When they wanted to fasten him with nails, he refused. “Let me be. He who gives me the strength to endure the fire will also give me the strength to remain at the stake unflinching, without the security of your nails.” When he had spoken the Amen and finished his prayer, the executioners lit the fire. Afterwards we were able to take up his bones and lay them to rest in our burying place. There we will celebrate the anniversary of his martyrdom in memory of those who have fought and won the fight before, and for the strengthening and preparation of those who still have to face it. Such is our report about the blessed Polycarp. —The Martyrdom of the Holy Polycarp, recorded Feb. 22, A.D. 156. Yesterday’s meditation encouraged you to enjoy the blessings God gives you each and every day, without looking back and wishing for an earlier time and place that was better, or as we say, “the ‘good old days.” But this does not mean we should not look back and see if there is anything of value we can learn from those old days; values and beliefs and behaviors that are worth preserving. This song by The Judds does a good job of getting that message across, as do the following quotes and verses. till I declare your power to the next generation, your mighty acts to all who are to come. I spent so much of my time here at Dunder-Mifflin thinking about all my old college pals at Cornell. The thing is, now I am exactly where I want to be– I’ve got my dream job back at Cornell– and I’m still just thinking about my old pals. Only now I am thinking about the ones I made here, at Dunder-Mifflin. I wish there was a way to know you were in ‘the good old days’ before you’ve actually left them. There is, of course, a way to do that, and that is to remember that each and every day, past, present, and future, is a gift of God, and to live in gratitude for each day as it comes, thankful for the blessings in it. Psalm 95:6-7 — O come, let us worship and bow down, let us kneel before the Lord, our Maker! For he is our God, and we are the people of his pasture, and the sheep of his hand. O that today you would hearken to his voice! We accept this law. But when we move into the moral and spiritual realm, we act as if we are on our own. So many of us seem to think that we have things exclusively in our hand. What we do is our business, and nobody has anything to do with it. This is the philosophy of our generation– and our neuroses and psychoses run away with us, and our nerves crack, and our jails are full, and our marriages are hardly more in number than our divorces, and our liquor and drug bills soar. Everywhere people are wringing their hands. Thugs mug, legislators steal and rob, business executives plunder– and we wonder why. What has happened? What has gone wrong? “Forgive us our sins, as we forgive those who sin against us” is a call to mercy. Forgiveness is not optional. It is the foundation of a healthy relationship with God and with others. To love mercy is to be like God and to love others as God loves them. I do not love mercy. Too often, I approach mercy as a requirement rather than a joy. I don’t like it, but if God insists, I’ll try. It seems so unnatural. I love judgment. An eye for an eye and a tooth for a tooth. What goes around comes around. Someday they’ll get what they deserve. Those are the phrases that trip so easily off my tongue. “I forgive you” sticks to the roof of my mouth. I love revenge fantasies. Someone cuts me off in traffic and has the audacity to glare at me. Immediately, my imagination kicks in. I fantasize that a few blocks later I see them getting pulled over by the police. I salute them as I slowly drive by. I can only imagine my struggle if someone really sinned against me. Bud’s hate took him on a journey of sleepless nights and drunken binges to numb the pain. It is also lead him to visit the bombing site. On that visit, he vowed to change. He remembered watching Bill McVeigh, the bomber’s father, on television and suddenly recognizing his pain and grief in that father’s eyes. …What displeases God is when his children fight. He is disappointed when we carefully draw dividing lines and refuse to touch or be touched by those on the other side. He grows weary of our selfish complaints. He is discouraged by our demands to have more than our brothers and sisters. When we begin to scream our hate for one another at the slightest offense, we try God’s patience and rebel against his will. We sadden our Father in heaven. Micah 6:8 — He has showed you, O man, what is good. And what does the Lord require of you? To act justly and to love mercy and to walk humbly with your God. James 2:12-13 — Speak and act as those who are going to be judged by the law that gives freedom, because judgment without mercy will be shown to anyone who has not been merciful. Mercy triumphs over judgment! Matthew 6:12 — Forgive us our debts, as we also have forgiven our debtors. Matthew 5:7 — Blessed are the merciful, for they will be shown mercy.